I felt like a celebrity mom this afternoon. 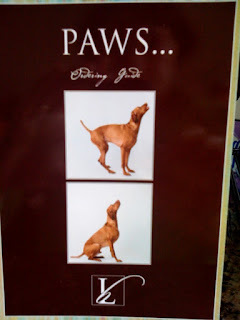 Nas and I took Remy to his Paws for a Cause appointment. 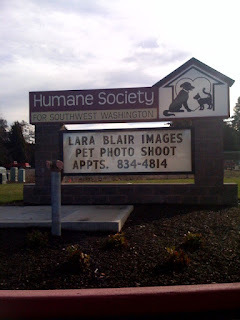 We walked in and Lara and two staffers from the Humane Society were so excited to see Remy. They all yelled, "REMY!!!" Remy loved the attention! Then Lara introduced Remy to the staffers and also the director of the Humane Society. She explained that Remy was her 'Rock Star' and also her PAWS poster child. I didn't realize what she meant until I came home, opened the ordering guide and saw Remy ON THE COVER! He is also on the inside. So proud! Cover of the ordering guide. Remy did great at his appointment! He performed on cue & did everything Lara asked (while working for treats, of course!). He also ate ALL the treats she had available. It's a good thing we were the last appointment of the day. Thanks Lara! Want to donate to a good cause? 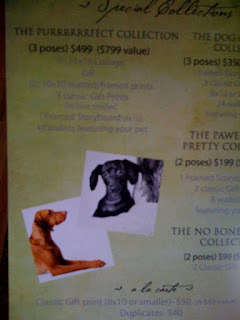 All the $ goes directly to the SW WA Humane Society. There is still time to book an appointment!